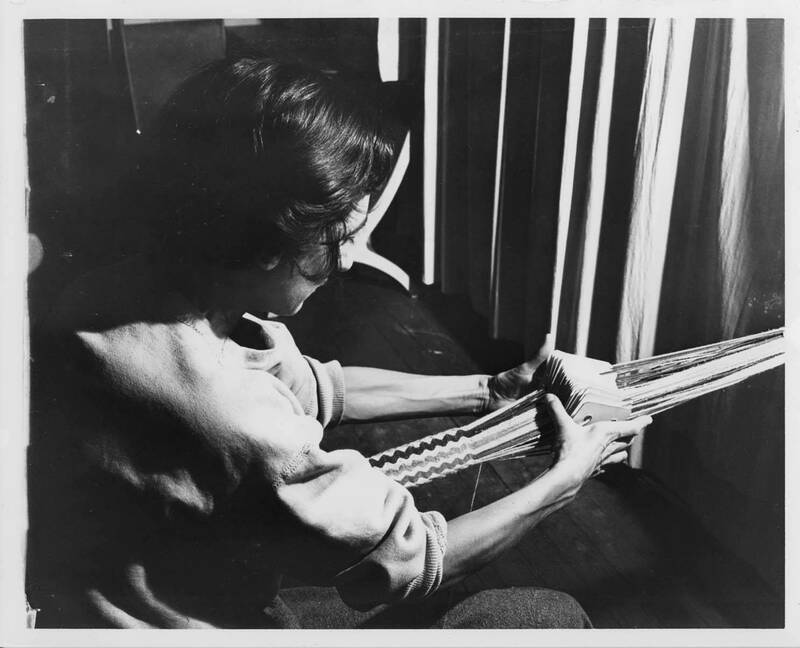 One of the first things I found at the very beginning of Black Mountain Research was an interview of Anni Albers conducted 1968 July 5, by Sevim Fesci, for the Archives of American Art, in New Haven, Connecticut. Albers speaks of her educational background; Paul Klee as a teacher; color in weaving; techniques and materials; Peruvian and European textiles; her “sound-absorbing” textile designed for the Bauhaus auditorium; and her weaving workshop at Black Mountain College. Weaving for Albers is a practise of connecting various forms of art production and crossing the boundaries of separated disciplines like painting and architecture. This understanding of weaving is crucial for my understanding of research based learning processes. SEVIM FESCI: That’s very interesting. I would like to ask you, today, – is weaving fashionable? Two weavers with rug loom, ca. 1940. Photographer: John Stix. Courtesy of Western Regional Archives.